I am a born natural speculator. When it comes to the stock market, everything is about timing. I remembered in the past when everyone said timing the stock market is impossible, I took that as a challenge and turned that impossible to the possible. After posts by posts, I have proven that I am able to capture the essence of timing in the charts. 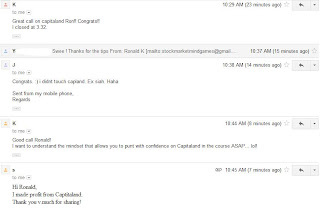 Yesterday at 9.06am, I told everyone to watch Capitaland as it was strong and I am timing my entry to the long side. 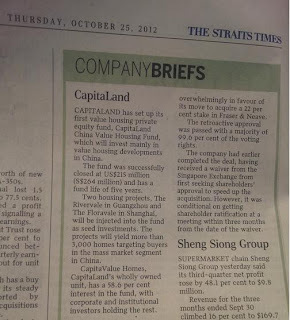 During that time, Capitaland wasn't in the Top Volume and was hiding behind the scenes. 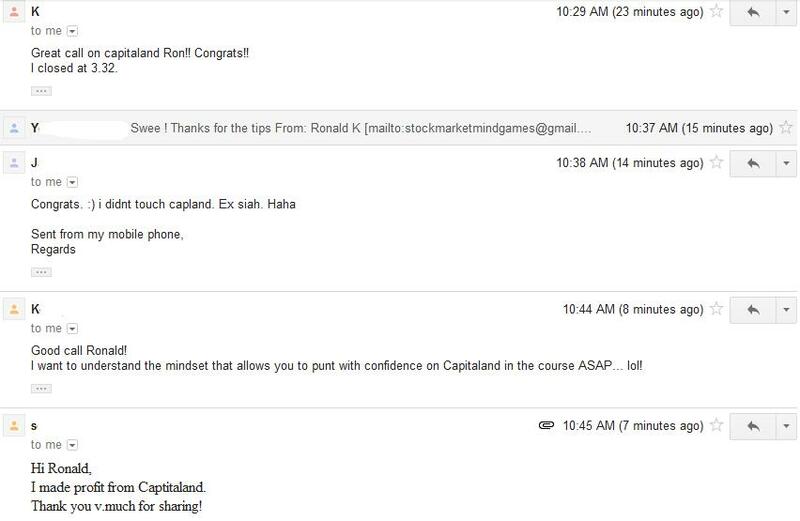 However at 4.48pm, I emailed to all my students, I quote them: "I believe tomorrow we shall witness Capitaland appearing in Top Volume with price rising. We shall watch." 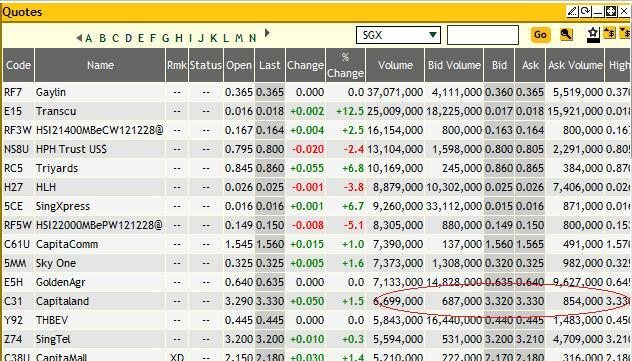 Today, we finally witnessed Capitaland appearing in the Top Volume after an hour of market opening with price rising!! Ain't it amazing?? 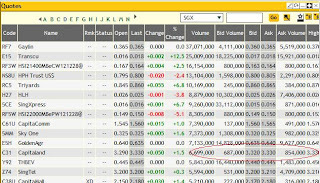 Of course, talk is cheap because it doesn't involve emotional rides, to back up my conviction on what I saw at 9.06am yesterday, I proved it with my 150 lots of Capitaland punt as attached above. The rest is history. Now my point is this, never let anyone put you down and when someone says you can't do it, use that as a motivation to work harder. There are a lot of motivational speakers and salesman in the market selling courses and giving talks, however they are not real speculators or traders. Those techniques they teach can be found in books and in the internet. There are also a lot of investment gurus, traders giving courses, however there is only 1 speculators that teaches things before it happen and that is me. I am not boasting myself, but I had proven and shown results. 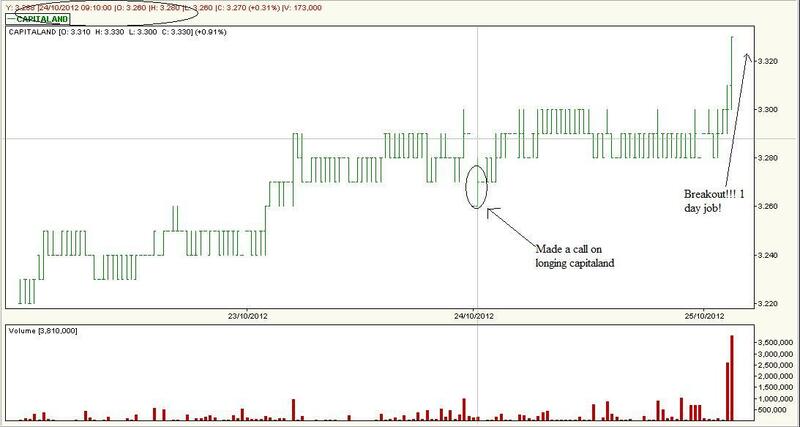 Minutes after the breakout, I received trade records from students and compliments from them that they made money. Truly made my day when I received these emails. It just tells me that they learnt something from the course which is so valuable yet simple. Also I want to make a point here, traditional support and resistance don't work all the time. Look at one question from one of my student. 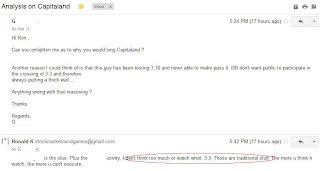 He asked me about Capitaland at $3.30 is a wall price, that's like the resistance. Look at what I replied, I said, "I don't think too much or watch what. 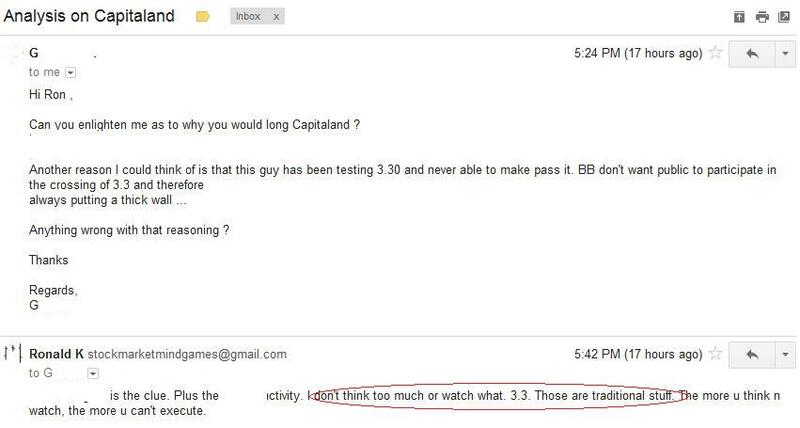 3.3. Those are traditional stuff. The more u think n watch, the more u can't execute." In speculation, we keep things to be simple, convicted when signals are flashing and be confident & fast in execution. That's a hallmark of a good speculator. The more we are entrapped in traditional stuffs like volume, support and resistance, the more we can't get a job done. 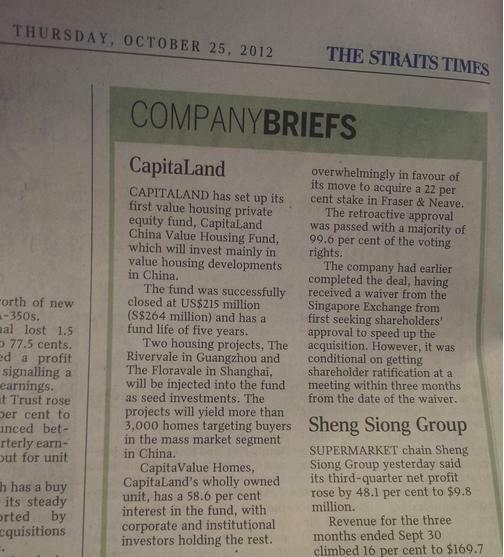 Also, another student sent me this news about Capitaland in the morning. Could it be this piece of news that drives the stock price? I don't know because I don't watch news. Whatever it is, the news is out and I am in the profits! STI - Profit Taking Indeed Took Place! Oceanus - Top Volume Trapping? SMMG X Production Films ? 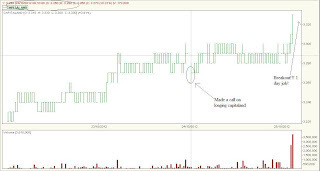 STI - Shorting At Breakdown Bar?